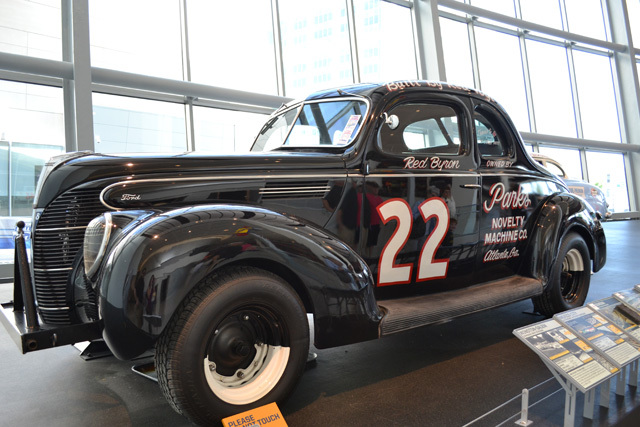 I feel like you can’t not visit the NASCAR Hall of Fame when visiting Charlotte. It would be like completely skipping Fenway Park in Boston. Both are located in the city proper and essentially go hand in hand for sports in the area. 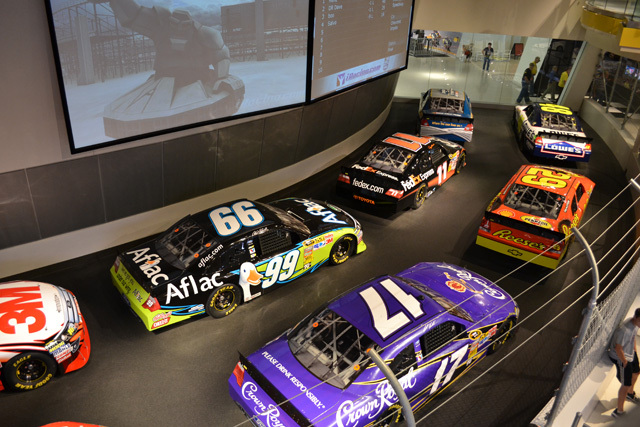 Charlotte is home to NASCAR so stopping by the Hall of Fame gives you a good chance of learning about the rich history of the great sport of NASCAR. 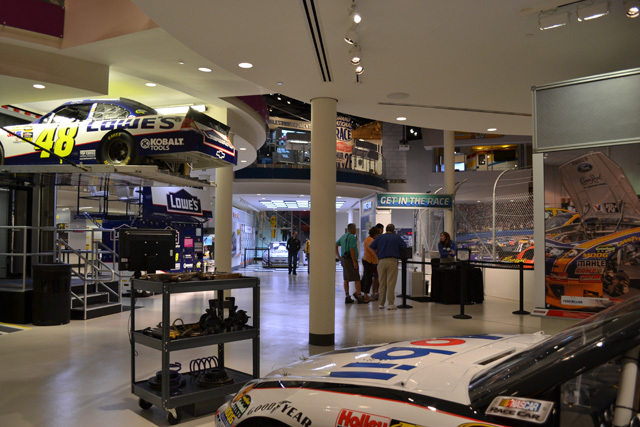 While I really enjoy NASCAR, I think that anyone could enjoy visiting the Hall of Fame. 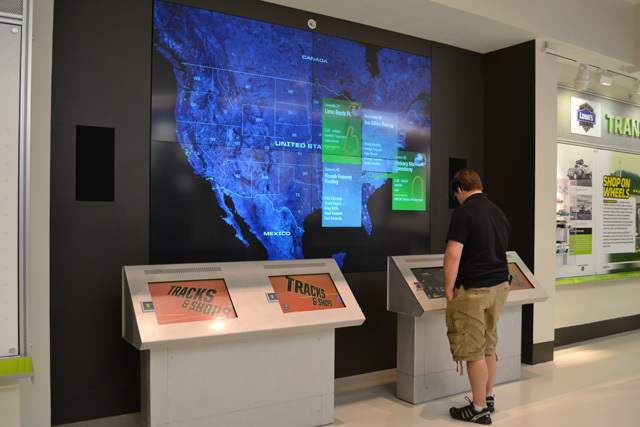 The exhibits and design of the space are overall really pleasing for a variety of audiences. Like old cars… it has you covered with actual cars used back in the day. Like hands on activities… you can play with equipment and tools. You’re a smarty pants… plenty of computer related games and quizzes. And honestly the majority involve just general logic that you could figure out without know anything about NASCAR. Computer games have you hooked… no problem! There are racing games that simulate racing at that weeks track so it’s constantly changing. This is a newly designed museum by the firm Pei, Cobb, Freed & Partners. 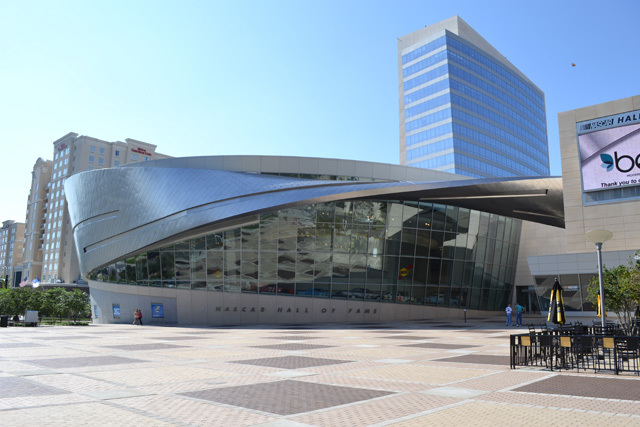 It opened in 2010 and was awarded the McGraw Hill Best of 2010 Award of Excellence in Architectural Design. Just looking at the building from the outside you can tell that it conveys speed. The swooping and twisting facade piece pulls from one side of the round front and detaches to become an entry awning. Once you step into the space you are greeted with shiny metal, carefully crafted details, and well lit spaces that guide you from space to space telling the story of NASCAR. 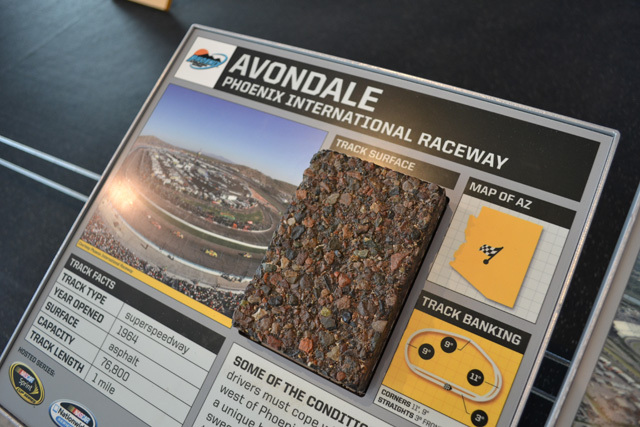 Along the track that swept up the entry hall, there were little plaques that provided information on the car featured or race tracks. As the track went up the ramp it’s banking increased so you could start out on the lowest point learning about a flat race track like Indianapolis Motor Speedway (9 degrees) and end with Bristol Motor Speedway (36 degrees in turns). 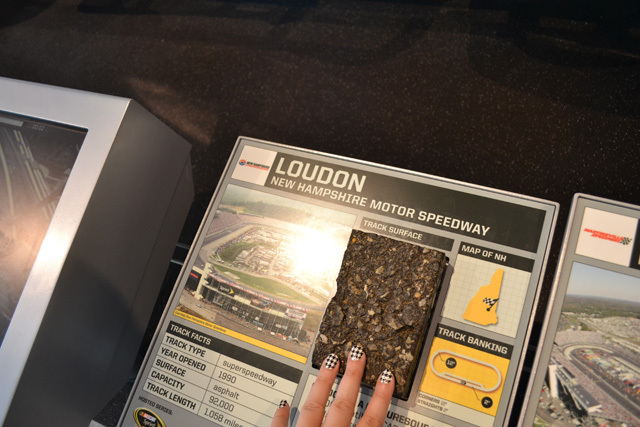 They even had some piece of track so you can compare them, showing how the banking and surface effect the performance of the car. In addition to the change in banking of the track, the cars progress in time as the track ramps us. The track starts with older cars (see 2nd photo from top) and proceeds to visually explain how the stock cars changed over time. The above photo is near the end where you see current day cars. There are 2 sections of track that you can step on that let’s you know just how steep the banking it. 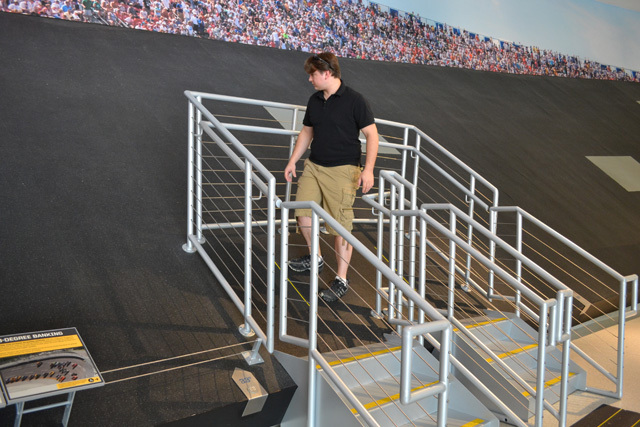 The first section is not difficult to stand on, but the second portion which is at the portion of track with 33 degree banking is very hard to stand on. Feeling this makes me feel impressed for the track officials that run out when crashes occur… very tough! 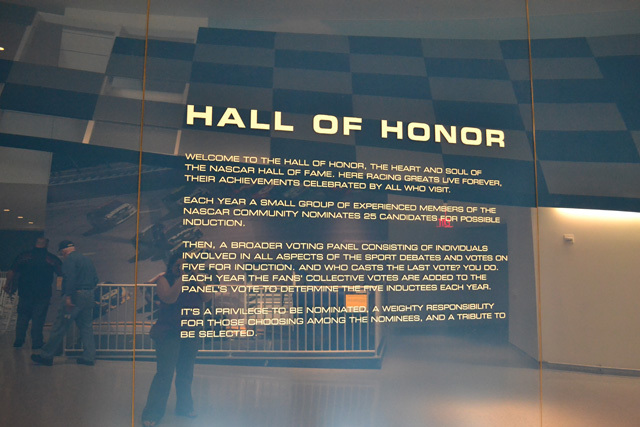 This hall focused on the newly inducted Hall of Fame drivers. Obviously Dale Earnhardt was included in the inaugural year. The induction for the 2012 members occurs in January and at the time a new series of cars and displays will be in that room. After the Hall of Honors on the 3rd Floor you walk into the NASCAR Performance Race Shop. 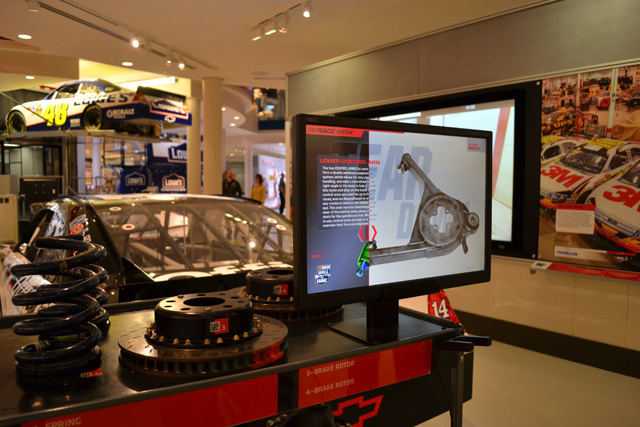 This interactive area shows how technical the cars are and how much science, math and skill is involved in adjusting the cars to allow them to perform their best at each different track. 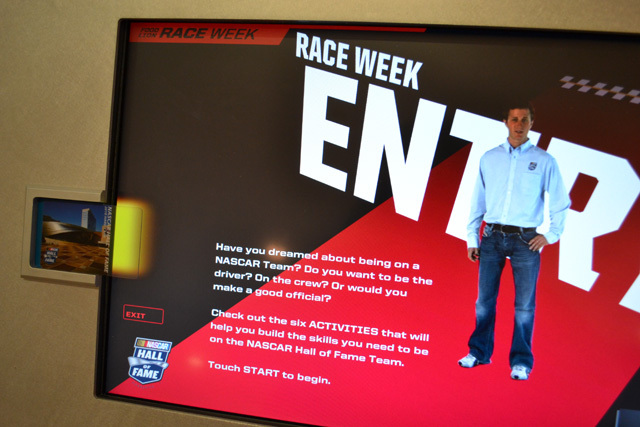 In addition to the Performance Race Shop area there is the Kids Zone, Transporter Simulator, Inspection, Qualifying, Pit Road, iRacing Simulator, and the Food Lion Race Week exhibit. Each of these areas give you a behind the scenes look at different aspects of racing. Many of them are hands on like the Pit Road area that has a situations testing your speed, agility, and strength for taking off tires or jacking up a car. 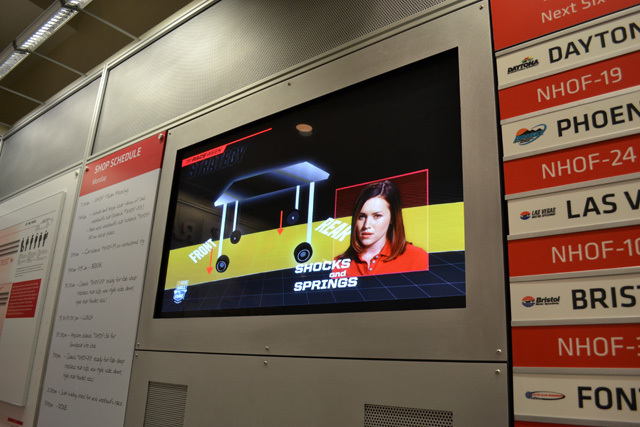 One really cool thing about the Hall of Fame was how it embraced new technology. This was a cart of tools and parts. Each of them had a QR Code and attached to the cart was a scanner. After you scanner an item the computer on top of the cart would refresh and give you information about that item. One of the mini exhibits is a hauler. 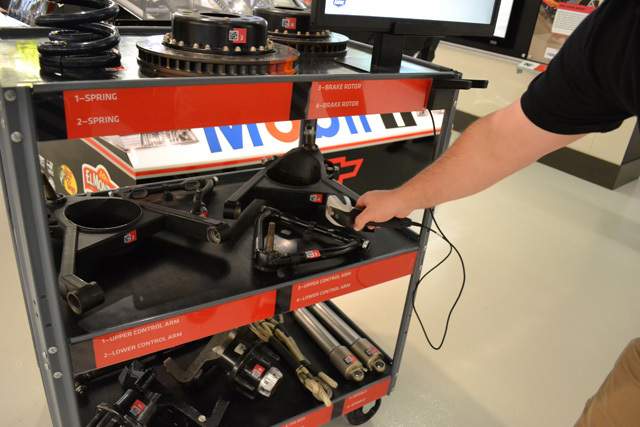 This provides you with a glimpse into the storage in the hauler, as well as what is stored inside. Pull out drawers and glass front cabinets showcase the equipment used. At the front of the trailer there is an area that allows for multiple computers to be set up. This allows for the crew chief to work on strategy while accessing previous race information, as well as weather, since that plays a big part in the races. When you first enter the Hall of Fame you get a card which provides your attemtance, was well as holds your profile. 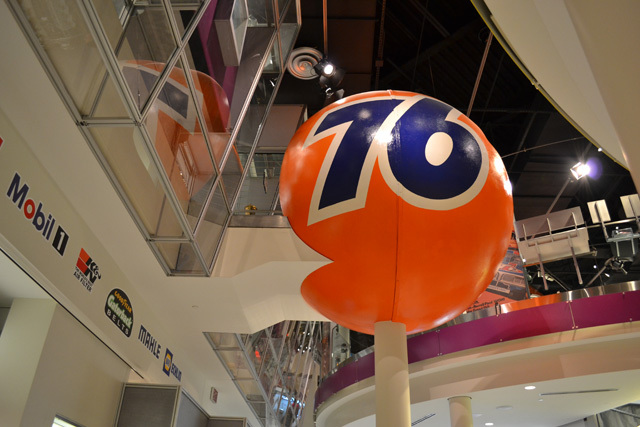 You set up your info on the card so you can play along with the games at the various stations on the 3 floors. When you create your profile you pick which driver you want to be you guide to create a personalized experience. Both Price and I picked Kasey Kahne. The 4th Floor houses collections that are even older than NASCAR itself. 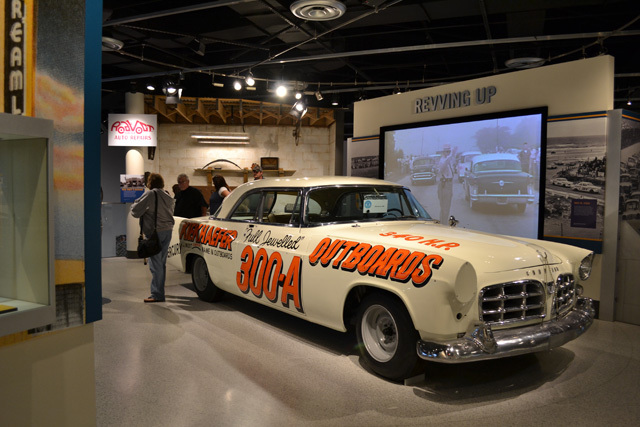 One such exhibit explains how auto racing began as an by product of running moon shine. 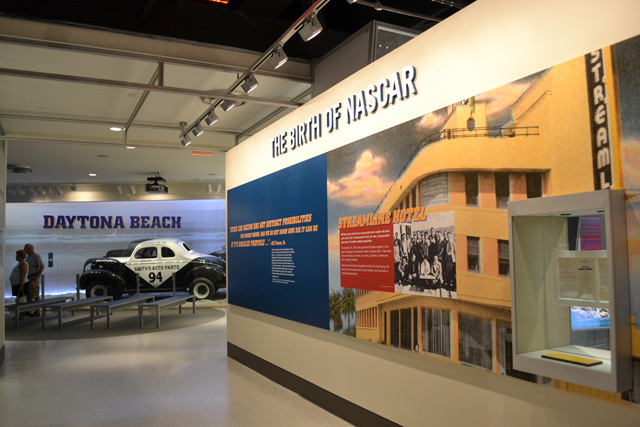 From there, the various exhibits feature different events in NASCAR history as well as the people involved. For example, there are statues of the significant people involved in the start of NASCAR honoring them. 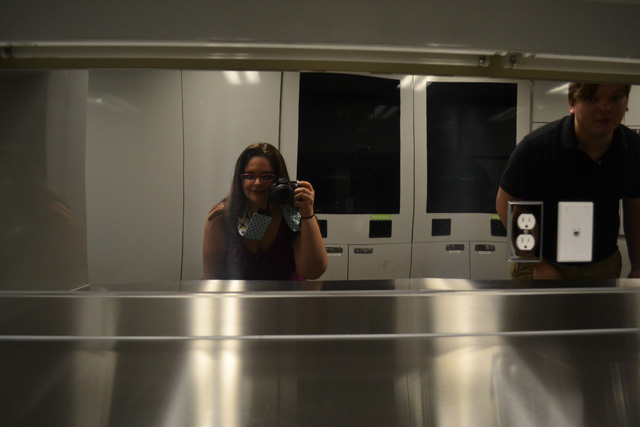 One of the most interesting areas, as least to me, was Artifacts Hallway which is a long corridor that has glass cases on both sides that are filled with memorial for different drivers. 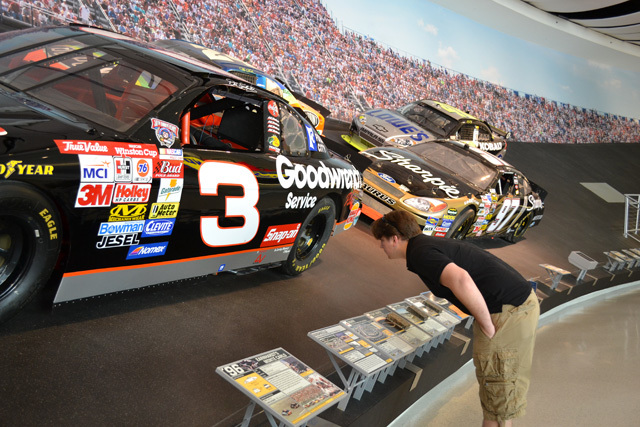 One of the biggest moments in NASCAR history is featured in the Modern Era exhibit. The 1979 Daytona 500 race is infamous being that is was the first time i the entire race was being televised lived nationally and that captured a memorable crash that resulted a fist fight on the last lap of the race. 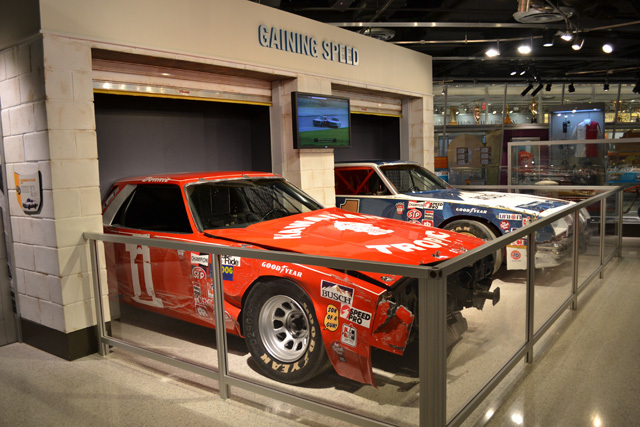 The photo on the right is on the actual cars involved in the wreck with leaders Cale Yarborough and Donnie Allison. If you happen to not be aware of the ending of the race check out this video of it. One of my favorite parts of the day was getting to ride in the simulator that allowed you to race on the current week’s track. In this case, we raced ‘at’ Dover. It was a little confusing to start but you can quickly get the feel of it and have a lot of fun. But don’t get black flagged since your time is cut short, be sure to do those pass thru penalties! The only thing that I was really disappointed with was the gift shop. The merchandise is really focused Jimmy Johnson, Jeff Gordon, Dale Jr, and Tony Stewart. I felt that they missed the mark in providing a bit more variety. I wanted to gift something small from Clint Bowyer but the only thing I found was a hat. I would have been happy if they had just one standing display of stickers for the rest of the drivers since I could have at least gifted decals to different people. Aside from the gift shop, I was really happy with the time we spent there. The package deal we purchased allowed us entrance into the Hall of Fame, a hot lunch (3? choices available), and a simulator ride for $28 a person. Plus they offer a children’s rate as well as military and senior discounts. It was a great value and a lot of fun. looks like an awesome time! Great recap! Yeah, we’re definitely going to have to plan a trip there – that is just way too cool to miss out on! I showed your pics to Daniel and he was just “Wooooow!” Thanks for sharing all of this!